Going paperless is not only a trendy movement, it’s also a highly practical step to achieving an efficient law office. Many large law firms are already there. However, if you are a sole practitioner and you don’t have your own IT department to carry out the technicalities, then going paperless probably sounds more like a hassle than a revolution. 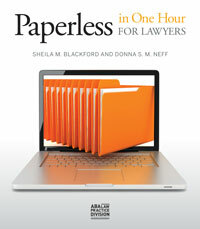 Important information found in “Paperless in One Hour for Lawyers” includes a guide to the essential hardware and software you will need, a review of the apps that are available, and an overview of the business practices that should be implemented. The sections are easy to follow and graciously concise. Read the book in one sitting—in one hour—and you’ll be good to go.